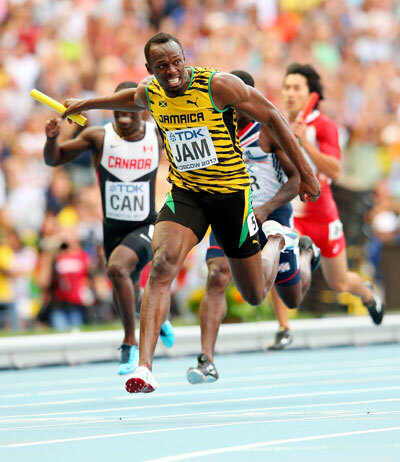 Usain Bolt and Shelly-Ann Fraser Pryce secured their third gold medals of the Moscow world championships when the two 100m and 200m sprint champions anchored Jamaica to victory in the 4x100m relays on Sunday. Bolt's task was made easier when American fourth-leg runner Justin Gatlin fluffed his start, stumbling and veering into the Jamaican's lane. The Jamaican quartet of Nesta Carter, Kemar Bailey-Cole, Nickel Ashmeade and Bolt secured the Caribbean nation a hat-trick of world titles in a time of 37.36. Gatlin brought home the U.S. in 37.66 with Britain taking bronze after putting an end to their past relay woes when they have often failed to get the baton around one lap. 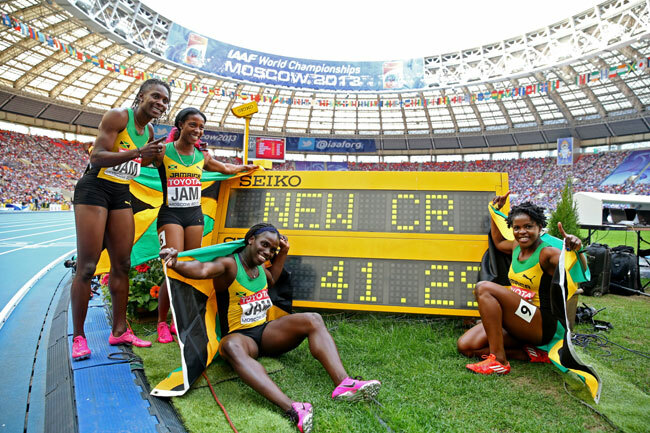 The Jamaican women regained the world title from the U.S., again helped by a costly error. The quartet of Carrie Russell, Kerron Stewart, Schillonie Calvert and Fraser-Pryce streaked to gold in 41.29, the second fastest time ever run. A mishap on the second and third interchange between Alexandria Anderson and English Gardner who started her run too soon and had to halt to grasp the baton, effectively ended U.S. victory hopes. France grabbed silver in 42.73 and it was only a storming final leg from Octavious Freeman that secured an unlikely American bronze, Freeman eating up ground down the home straight with a sizzling run to get into to a medal position. The U.S. set a stunning world record of 40.82 at the London 2012 Olympic Games but none of that victorious quartet featured in the Moscow final, notably Allyson Felix who tore a hamstring in the 200m final and 100m bronze medal winner Carmelita Jeter who was left out. 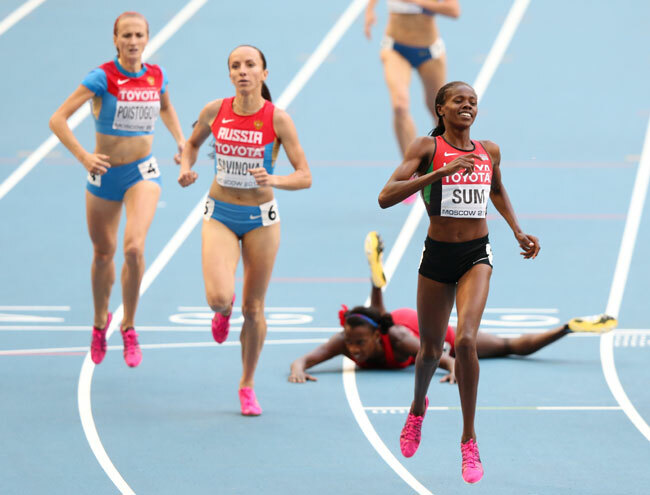 Earlier, Eunice Sum of Kenya held off Olympic champion Mariya Savinova at the end to win the women's 800 meters. Sum won in 1 minute, 57.38 seconds. Savinova, who was also the defending champion, was second in 1:57.80. Brenda Martinez of the United States took bronze in 1:57.91. 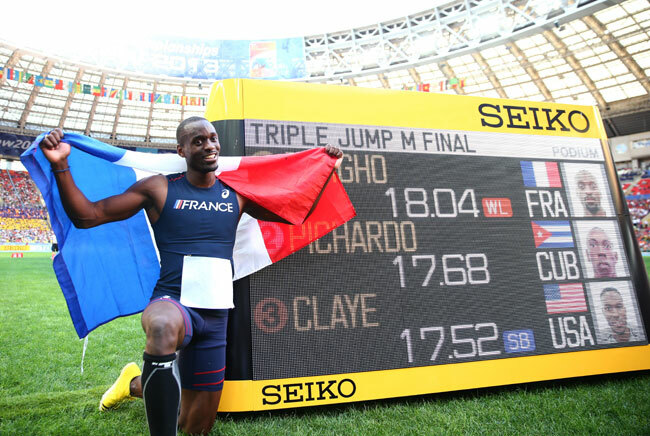 Teddy Tamgho of France won the men's triple jump, edging Pedro Pichardo of Cuba. Will Claye of the United States took bronze. Tamgho and Pichardo were even at 17.68 meters but the Frenchman, a world indoor champion, made the difference on his last jump when he leapt 18.04 for gold. Claye was third with a jump of 17.52. Olympic and defending champion Christian Taylor of the United States could only finish fourth with a leap of 17.20. Kenyan Asbel Kiprop put last year's Olympic disappointment firmly behind him with an emphatic 1,500 metres world title defence on Sunday. The long-striding Kiprop's devastating finishing kick quickly took him clear when he loomed up on team mate Nixon Kiplomo Chepseba's shoulder around 80 metres from home and he coasted over the line in 3:36.28. 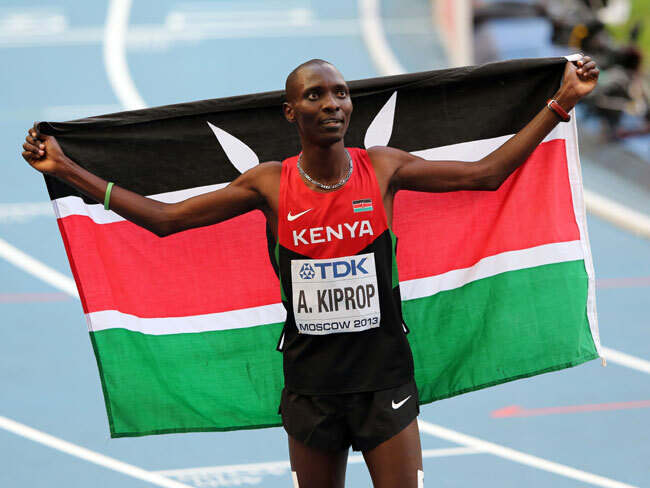 Kiprop, Olympic champion in 2008, finished last in London when he was nursing a hamstring injury but has been in hot form this season, including a scintillating run in Monaco last month when he became the fourth fastest of all-time at the distance. In the battle for minor medals, American Matthew Centrowitz (3:36.78) took silver and South African Johan Cronje (3.36:83) bronze. Algeria's Olympic champion Taoufik Makhloufi missed the championships through illness. 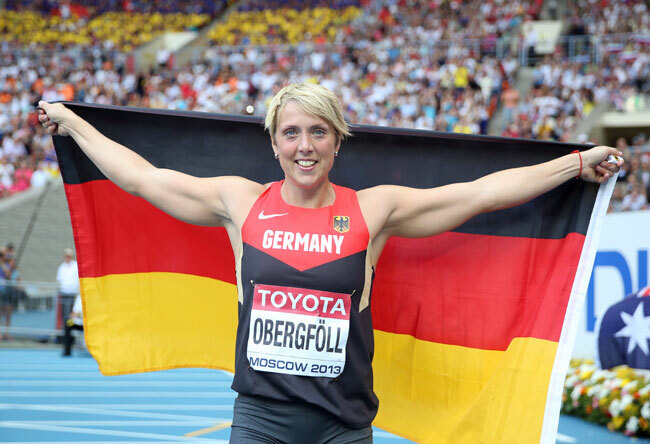 Christina Obergfoll was the unexpected winner in the women's javelin. The German veteran had won silver at the London Olympics. It was her first major win.